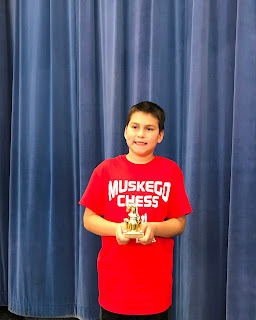 Anthony takes on 150 WSCF players, or at least maybe that's what it felt like?! 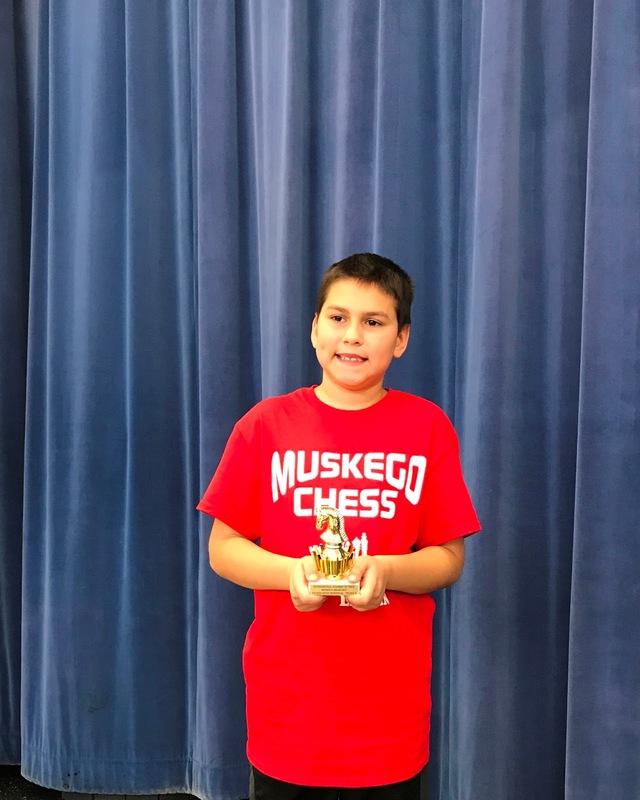 Anthony was the lone player from our MSCC to attend the Nicolet event on Saturday that was run by the WSCF club. He had a great day, taking 4 out of 5 matches and finished 5th place in K3! 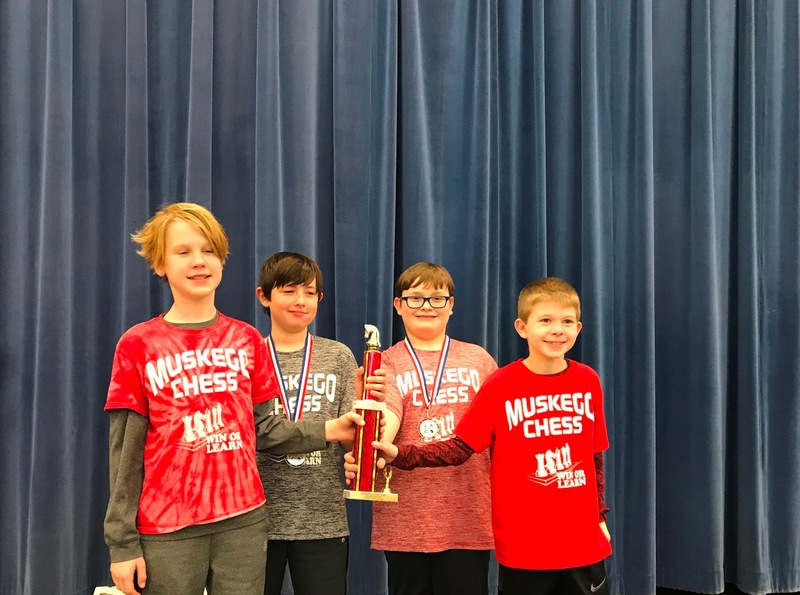 The SMCA, or Scenic Moraine Chess Association, is comprised of Muskego, New Berlin West, Brookfield Academy, Brookfield East, Eisenhower, Kettle Moraine Lutheran, Kewaskum, and St. Johns NMA schools. 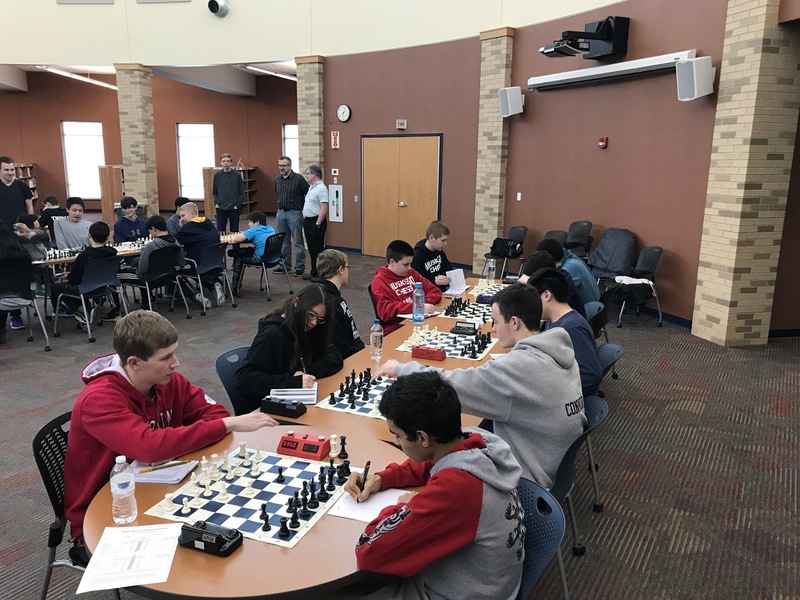 These schools send their varsity teams (top 5 boards) to play in head to head matches, while the junior varsity team plays a swiss style event similar in format to other tournaments. 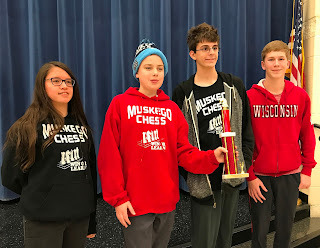 Muskego's Varsity team of Will S, Alyssa P, David B, Adam P and Aaron G took on Kettle Moraine and won the first round. They then played against Brookfied Academy's JV team for round two as St. John's was unable to attend, and won that match. They finished by playing a very difficult Brookfield Academy Varsity team and barely lost. These are all G60 (up to 2 hour) matches. Steven A. was our lone JV player for the day and did very well, winning 3 of 5 matches. In January we will host Eisenhower at Muskego, and in February we'll have our season finale against Brookfield East, New Berlin West, and Kewaskum. 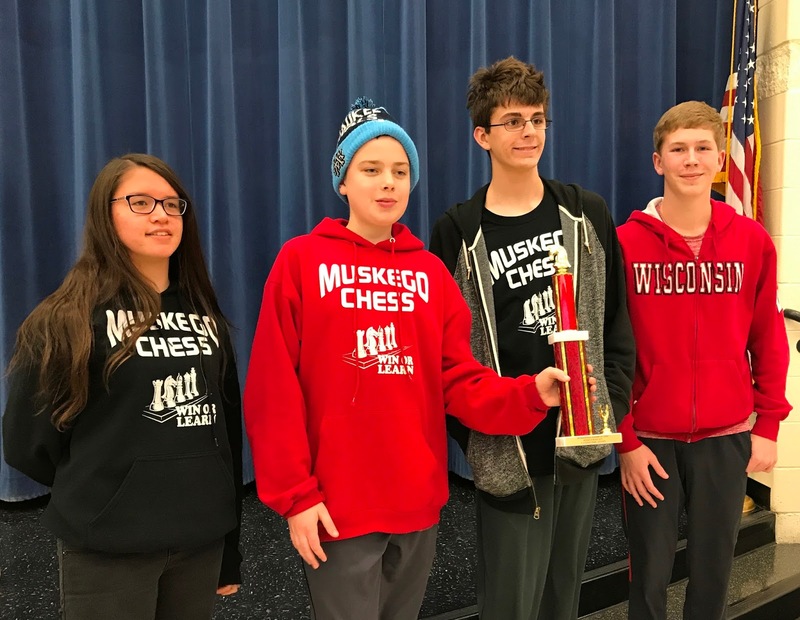 Another annual Muskego Melee went off without a hitch this past Saturday at Lake Denoon Middle School. We had 84 players from our club and surrounding communities in 4 divisions. It was run very well by the IAC and we had a lot of fun! The event also brought in funds for our club of over $600! 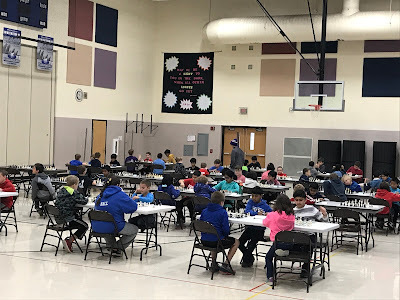 This tournament could not have been successful without the help of SO many volunteers, from setting up on Friday (big thanks to Riva and Kreuser families!) to running concessions and clean up on Saturday. Big thanks to Mark Nagy of LDMS for spending so much of his personal time to support this great event. K3 rated - a more difficult day than normal as this division had to be combined w/ K6 due to the limited number of players. Anthony R and Gidion K did a great job taking 2nd and 7th place in this division. Josh K had a good day and took 7th place. Our Big Bend players Cael and Carson B and Will B had a great day in their first tournament! 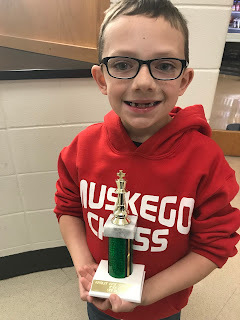 Cael took the top spot at 2nd place, and together they took a 2nd place team trophy! Rishi S played some good matches in this tough section. Luke N and Andy P stepped up to join Nelson K and Logan O in the rated section, and they all played well! Nelson took the top spot at 9th place, but together they took home the first place team trophy! 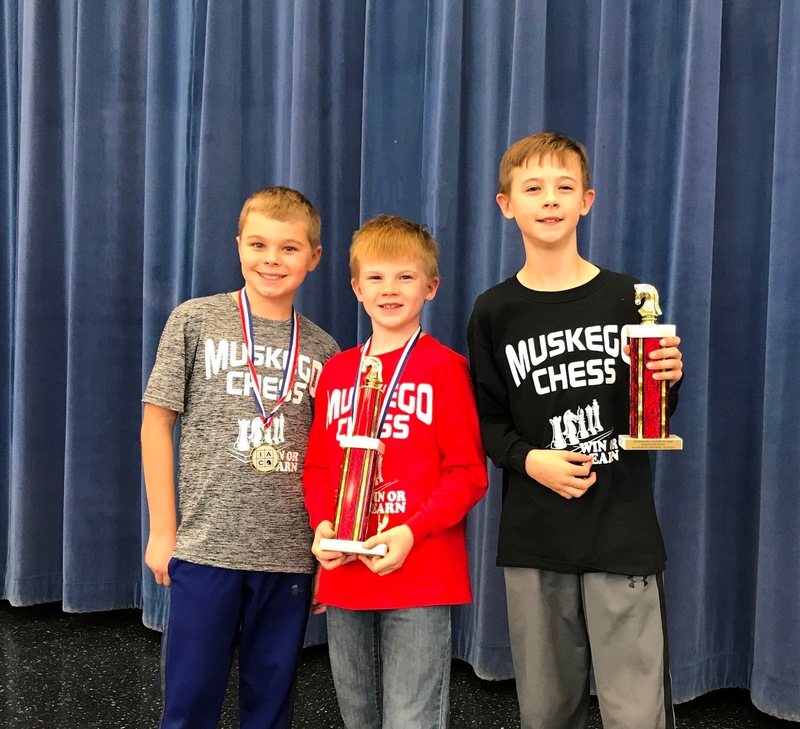 Elijah T was the sole player from LDMS and Brody B and Steven A represented Bay Lane in this difficult section and played some good matches. MHS was represented by Grant B, David B, Alyssa P, Adam P and Will S. Will took the top place at 7th, but together as a team they took the first place trophy! We saw a lot of slow, well played matches, and good sportsmanship by all. 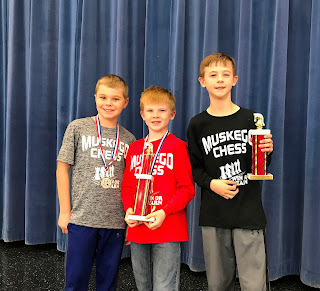 Congratulations to our players on a great day - looking forward to the next tournament! No class on 12/27 and 1/3 Happy Holidays to All!